A Marks & Spencer foodhall for Rustington was approved last week, but not before dividing councillors on the merits of its out-of-town location. 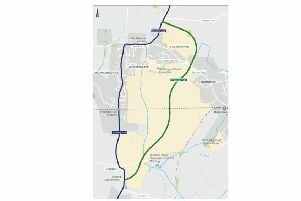 A hybrid application, seeking full permission for the foodhall and outline permission for a public house on land south of the A259 and east of Brook Lane, was discussed by Arun District Council’s development control committee on Wednesday (October 3). Officers had recommended plans be refused on the grounds they had failed the sequential test, a planning principle that looks to develop certain types of locations before others. Guidance suggests available town centre sites should be fully occupied before permission is granted for out-of-town locations. This is relevant in this case because the former Waitrose site in Littlehampton town centre has stood empty since the supermarket moved to Rustington in 2015. The committee was split on the application, with the final vote tied at six each, before plans were approved on chairman Richard Bower’s casting vote. Asking why Marks & Spencer was opposed to using the former Waitrose site, Michael Northeast (Lab, Courtwick with Toddington) said: “We do have a ready built supermarket already there, that is empty at the moment, which could be converted to house this development. It doesn’t need to go on the A259. Barbara Oakley (Con, Middleton on Sea) took a pragmatic view of the likelihood of Marks moving into the Waitrose site. She said: “There is a public demand for Marks & Spencer on this new site. “We should face the facts. Rather than what we would like to see happen, we’ve got to face the facts as to what would happen. The application has had a complicated history. The plans were approved in June 2016, but this decision was quashed in February 2017 after a legal challenge. When the application returned to the committee in May, it was deferred to allow members to visit the site. Edward Ledwidge, of Montagu Evans, representing the applicant, confirmed Marks & Spencer’s ‘commitment to bring forward this development’. He highlighted the work that had been done to agree which financial contributions – known as Section 106 agreements – would be given by the applicant. These included money to help make improvements to the Littlehampton railway crossing and money to help fund a bus service at Rustington. What do you think of the decision to approve the plans? Email the newsdesk.